Splish, splash, splosh! – Making Memories in The Chaos. Evening folks. *Looooooooooooooooong exhale* Monday evening, kids are in bed, time to chill – a little! Need to try to get the washing machine going again – I think a sock or something has got stuck, need to mop the kitchen floor – I spilled and squashed a tub of VERY soft blueberries, and I need to tackle some ironing – haven’t done any in 2 weeks! Huge mountain awaits me – fun! Today it was back to routine – have to admit, I do love routine. Have to say though, I’m not so keen on the old ‘kids back to school’ routine! I love having them all at home – pre school means your day has time constraints, plus I do kinda miss J when he’s not around. Anyhow, always good to get the first day over and out of the way – it’s always the hardest isn’t it?! 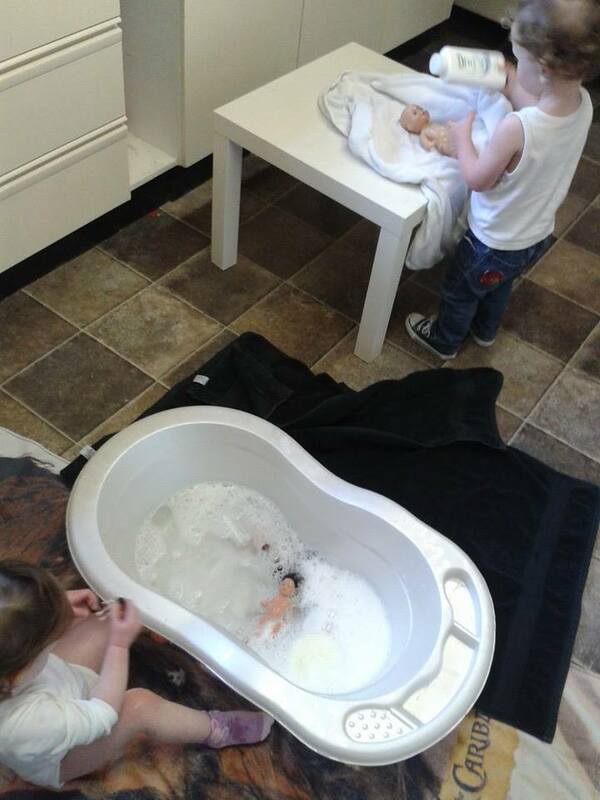 This month I have decided to do some wee play activities with the 3 munchkins around the topic – “Our body” – taking care of it and naming the different parts. It’s one which works well for all 3 of them at different levels. It always used to amaze me that some, otherwise very capable children in my P1 class didn’t know where some parts of their bodies were, shoulders and eye lashes for example! A certain phrase springs to mind here also, but I will refrain from using it! So, throughout January I am going to be playing, reading books, singing songs with this topic, “Our body”, in mind! Today we started off by combining 2 of L and S’s favourite things – dolls and water respectively! 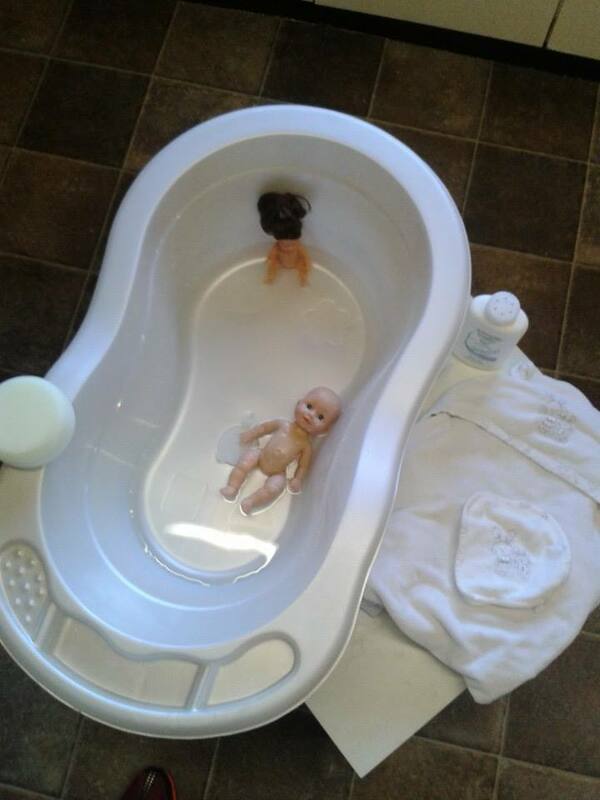 We gave our dolls a bath. We are fortunate around here in having a mix of both girls and boys in the house as it means that we have both gender of toys to play with. I know some people have different opinions on boys playing with dolls etc….but I neither discourage nor encourage it!!! And that is a whole other topic that I am not going to get into. 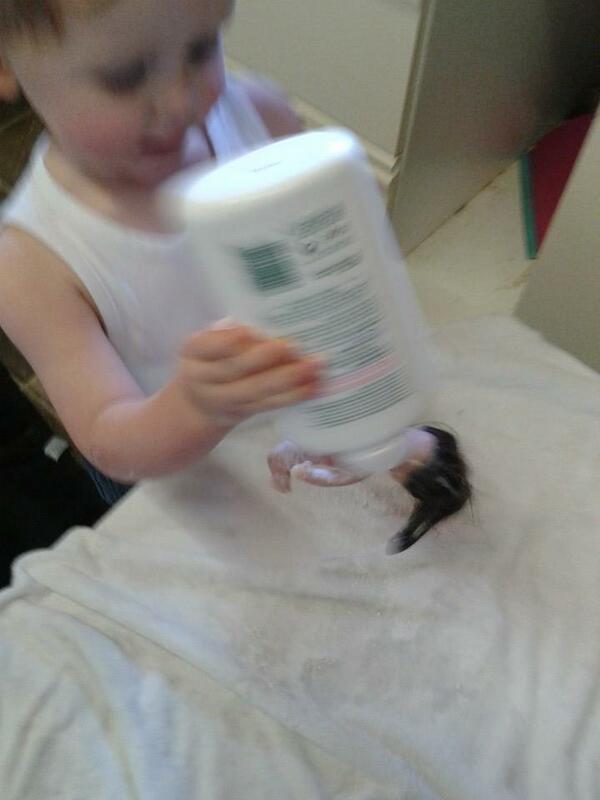 So, yes today we got out the baby bath, some dolls, towels, sponges, bubble bath etc and bathed the dolls. They had a lot of fun. We talked about each part of the body as we washed it, I asked L to name some and point to some, S was able to name them and for J we extended it a little further again – talking about things like spine and forehead. We also had a wee chat while we played about why it is important to keep clean. And now for some serious talc-ing!!! This was a really simple activity to set up, all the materials needed were already in the house and it kept them busy, playing together happily and learning for most of the afternoon! Why not give it a wee go in your house? I’m sure your kids would love it! My Miss E was throughly enjoying being Mummy to her dolls today. Me and hubby agree with boys play with dolls, they need to play at being Daddy just like girls need to play Mummy. 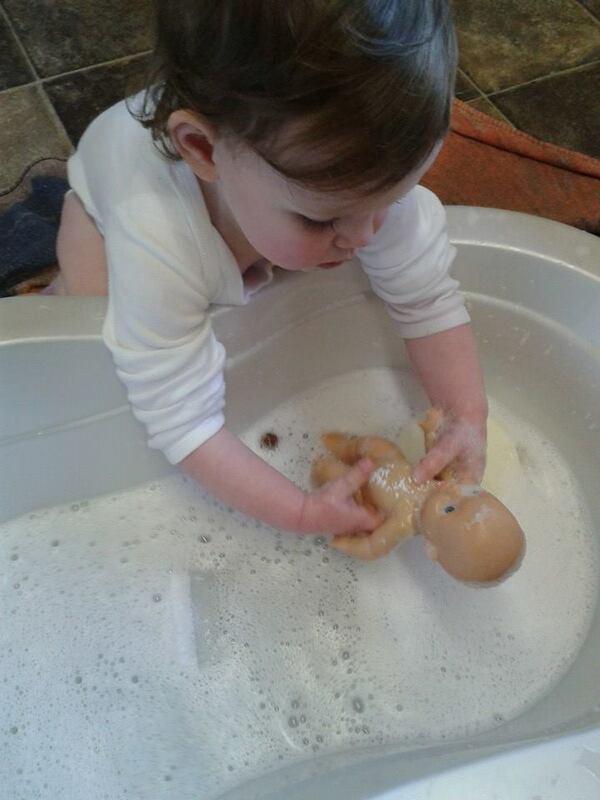 Oh I’m so glad that I never had to give dolls a bath! Looks like fun, and a great learning experience; however, it still falls under the “so glad I never had to” category! We are back in the routine, too, and as much as I love my son, it felt good to have him out of the house. Until a few hours went by,then I totally missed him! Lol at your “so glad I never had to”!! It’s a bitter sweet this going to school business – the thought of a wee break is always so much nicer than the actual break! so cute and I know they loved it! kids love to pretend to be grown ups taking care, so sweet. I may have to try this with my son. Awh your son would love it too! You’re so right kids do love to pretend to be grown ups and use grown up things! !